Our dedicated team of factory-trained and authorized contractors are proud to offer foundation repair services for homeowners across the United States and Canada. 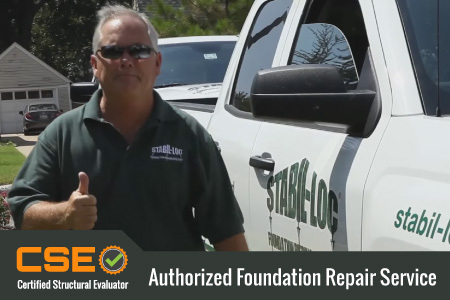 Using advanced foundation repair systems and Certified Structural Evaluations, our pros will determine the causes of your foundation problem and provide a permanent solution. The patented Stabil-Loc Foundation Piering System is the number one method in the foundation repair industry for providing the homeowner with a permanent foundation repair solution.Our double walled heat extruded steel tube positioned directly under the center of the wall to be lifted or stabilized and driven hydraulically all the way to bedrock or stable strata provides the deepest strongest foundation support available. The patented rotating head assembly maintains concentric loading during the lifting process. Traditionally, the house must be over lifted to insert shims. Our adjustable “shimblock” eliminates the need for over-lifting the structure which can cause damage to your home. The special epoxy material is injected in all cracks and crevices to prevent moisture from the earth getting into the basement environment. This will help to restore the concrete used in the foundation back to its pre-damaged strength, along with the help of our other structural repair products. Eccentric loading was developed in 1917 based on the premise that the pier had to be installed from outside the footing and fastened to the footing with a bracket, because the house was in the way. Using traditional brackets along the side of your structure proved to be an inadequate technique for foundation repair. Lifting the structure with piers and brackets at an angle or offset to the side of your home would eventually bend or break the pier, or improperly raise the foundation. In the diagram to the left (or above on mobile) you can see the instability of other systems that cause them to fail and could cause additional damage to the structure. The Stabil-Loc Foundation Piering System segmented the shaft of the pier into 12-inch interlocking segments so the pier could be installed directly under the center line of the weight of the wall being lifted. The bracket was then inverted and rides against the bottom of the footing as a load bearing plate that rotates as the structure is lifted. The location and configuration of the pier combined with the highest compressive load carrying capacity in the industry makes it obvious– THIS PIER CANNOT FAIL! 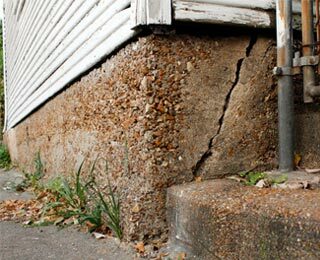 This is a common structural problem seen on both old and new homes, and it can affect a foundation regardless of where you live in the United States. There are many causes that can be attributed to a sinking foundation. Evaporation: hot and dry conditions cause soil to shrink. Transpiration: Tree roots dehydrate soil causing soil shrinkage and settlement of your homes footing/slab. 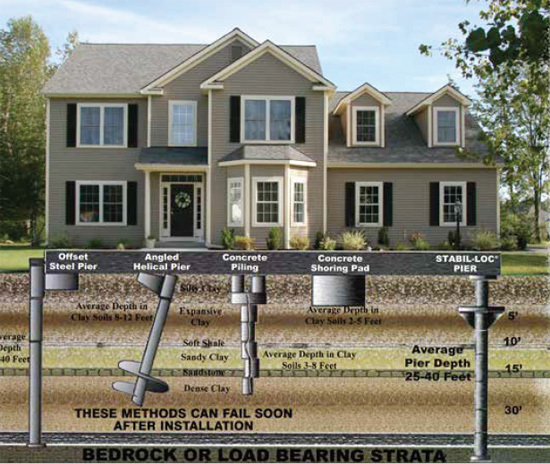 Drainage: Improper drainage causes increased hydro static pressure on basement walls. Poor Site Preparation: Improperly compacted fill soil causes settling problems later. Poor Soil Conditions: Expansive clay soil and organic debris cause contraction and expansion of soil. 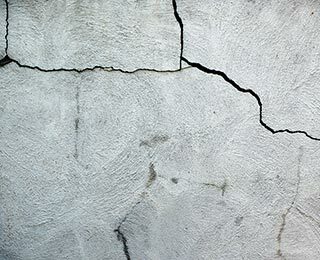 Cracks in a foundation can be caused from settlement, heaving, subsidence or from improper construction techniques or materials being used during the time when the home was being built. It is important to get the damage evaluated by a trained professional to determine the cause and develop a protocol for the repair. The longer you wait to get your floor or wall cracks repaired, the more likely it becomes that water from the surrounding soil will seep inside and cause damage to your basement environment, including anything that you may have stored there.oil. 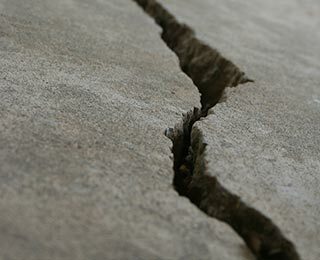 A crack in the basement floor is often caused from settlement of the perimeter foundation creating a void under the floor and removing its support. Hydrostatic pressure then forces water up through the crack up onto the floor. Another common problem is hydro static pressure forcing water around the edges of the floor and up into the basement environment. 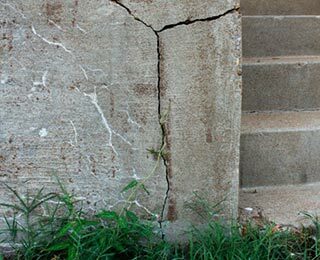 A vertical crack in the basement wall is an indicator of settlement or subsidence due to changes in soil conditions, changes in soil moisture content or improper site preparation prior to construction. A horizontal crack indicates changes in moisture and pressure due to freezing and thawing along the area of the fracture. A diagonal crack indicates hydrostatic pressure pushing the basement walls in. 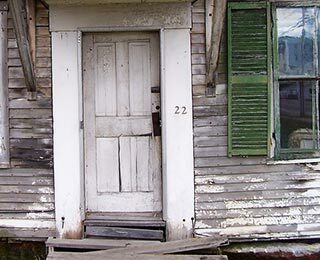 If you have windows and doors in your home that are difficult to open or close, it is likely a warning sign of an underlying structural problem. If you notice these symptoms, corrective action should be taken or the problem could get progressively worse.